That life is a never-ending learning process is a hackneyed idea, but it carries with it the idea that learning is down to the individual. Once compulsory education is over, it is completely up to them to decide on what and how to educate themselves. Korea’s academic pressures are notorious. Starting from an early age, students struggle to meet the expectations of their parents and teachers. If they hit the end goal of getting in to a good university and landing a reputable job, they often consider themselves freed from studying, rather than eager to take more classes. But for those who are motivated to educate themselves, the times that they don’t work become free times to develop autonomously. “If I retire one day, I will still need a way to make a living. I want to continue working,” said 47-year-old computer teacher Lee Hye-sun. 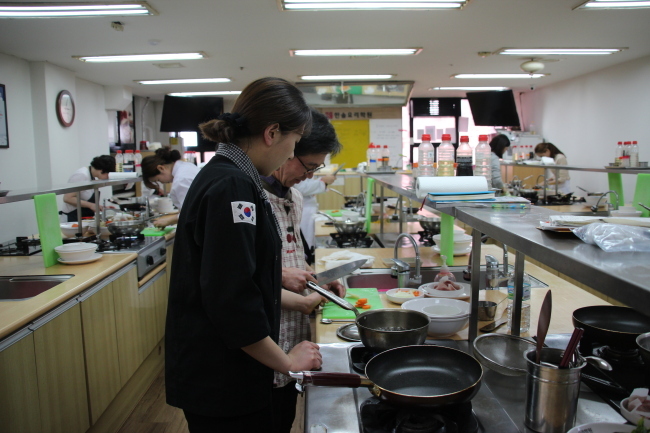 She had just signed up for a three-days-a-week cooking class for a professional certificate in Korean cuisine. For the next two months, she will be spending her free time honing her culinary skills. “I’ve taken baking and barista classes, too. Maybe I can start my own cafe or a restaurant in the long run,” Lee said, adding that even if she were to hire someone, she would still want to know the ropes to make sure nothing goes amiss. Lee is not alone in having such thinking. 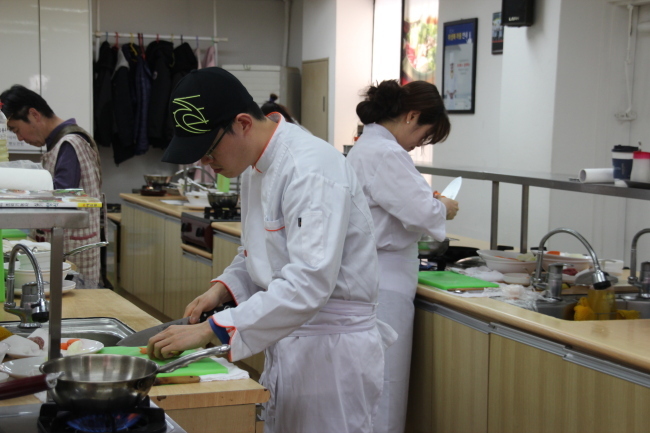 Han Ki-tae, a 38-year-old salesman who has worked over 10 years at an engineering firm, said that he took up sports and piano before he joined the dessert-making class he is currently enrolled in. “I first started taking cooking lessons two years ago,” said Han, who stepped outside for the interview while his pink roll cakes were cooking in the oven. 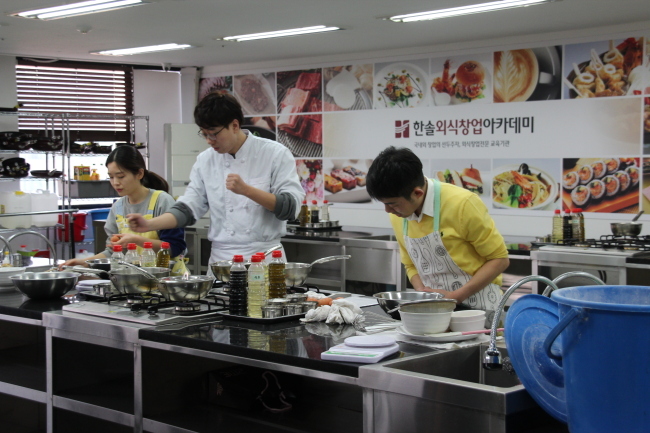 Han spent four hours every Saturday at the cooking academy situated in Jongno-gu, Seoul, an hour’s drive away from his home in Yongin, Gyeonggi Province. The time he invests in pursuing this extra-training outside of work provides more than what meets the eye, according to Han. “One might think it’s tough working five days a week and spending the precious weekend taking classes, but surprisingly this is my way of finding peace,” Han said. Han did not have an immediate plan to quit his sales job, but adding new skill sets enriched his overall lifestyle. Outside the walls of the cooking institute, Saturday was lazily rolling out amid the clear skies of March’s warming weather. But within the walls, packs of people were busily occupied in front of chopping boards and bubbling saucepans. The scene wasn’t much different at a Chinese language institute near Yonsei University and Ewha Womans University in Seodaemun-gu, Seoul. Being the university area, the district has diverse educational institutions called hagwon, where students can sign up to get extra kicks for their academics. Not only students, but also employed people are returning to the area for early morning, late night or weekend classes to help boost their careers or seek new opportunities outside their usual perimeters. Choi Jae-kwang, a team leader at Netmarble Games, said he often traveled to China to meet Chinese buyers and clients. In the near-10 years he has worked in the field, he had put off learning Chinese and hired interpreters to help his conversations. But to help build his competence he has finally decided to enroll in a beginner’s course. “Today was the second class,” said Choi, packing up his bags after the grueling hours he practiced pronouncing the Chinese intonations. “It’s recently become an annoyance that my interpreters water down my feelings in the middle as they translate. I want to be able to directly express complaints on the occasions where I need to,” Choi said. Choi’s classmate Kang Jeong-hee, who has worked for Incheon International Airport Corp. for 17 years, said he doesn’t need to learn Chinese as there are enough new recruits at the company who are more than apt in the language. The reason he is taking the Chinese class is because he has an ambition to break free from his present job and start an online shopping mall targeting Chinese people. “I want to learn basic coding too, so that I know what’s going on when I outsource the webpage making to a professional firm,” Choi said. The Korean government provides subsidies for people seeking lifelong education at more than 2,300 educational institutions. These institutions cover diverse subjects from computer skills to language to handicraft. According to data released by the Ministry of Employment and Labor, from January and end of December in 2016, nearly 550,000 people applied for the nationally funded program that aids people who wish to register for courses at career-advancing classes. Those younger than 30 took up more than 33 percent of the tally, while those aged above 50 accounted for 15 percent.